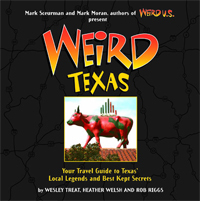 You probably wouldn't expect a graveyard to be the must-see attraction of your vacation, but if you're visiting family in Tyler, odds are that's exactly where your relatives would take you. It seems there isn't that much else to do in the area, because Rose Hill Cemetery gets more than its fair share of traffic, most of which consists of people eager to see the way-out gravestone of Madge Ward. Ward was an entertainer in life, and though she's been dead since 1995, she still attracts an audience. Locals drive by to point her out to their friends, out-of-towners pile out of rented minivans to get a closer look, and even a tour bus or two has been known to roll by, pausing momentarily so its passengers can snap a quick photo through the windows. Now, unless you have a serious electrical short between your left and right hemispheres, you should be able to figure out just what the deceased did for a living. 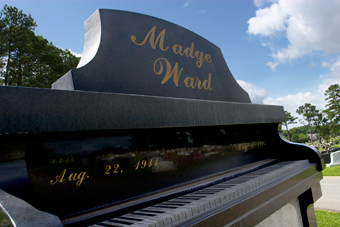 Like a wiener-shaped hot-dog stand, a mausoleum in the form of a piano pretty much spells it out for you: Madge Ward tickled the ivories. For most of her 83 years she played the piano, performing her one-woman show at resorts and hotels, in New York venues and on cruise ships around the world. She entertained troops during World War II and taught music to school kids. And obviously, she loved what she did. Near the end of her life, Ward commissioned a Tyler memorial builder to design a gravestone that would convey her passion after she was gone. 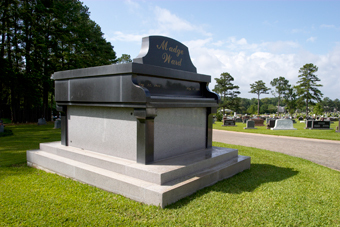 The result is an 8-foot-tall, 25-ton grand piano inside which Ms. Ward rests eternally. The largest single-person monument on the grounds, the granite piano took more than a year to design and build. The price tag has been kept a secret, but custom monuments like Ward's typically cost tens of thousands of dollars. According to the piano's designer, Ward said she had been saving for it for 35 years. Sadly, the pianist never got the chance to see it in person, since the monument wasn't set in place until just after her death. Ward only saw her resting place in sketches and in photographs; the actual cutting was being performed out of state. But it's just as well, since she didn't have to hear the subsequent whining from some of the locals. After the piano was erected, it struck a sour note with a number of Tyler residents, who called officials to complain. Apparently, not everyone appreciated Ward's individuality. It's a good thing she didn't play the tuba.